The New England Revolution return from a trying, cross-country road trip to face the Columbus Crew at home on Saturday night. TV/Radio: Comcast Sportsnet; 98.5 FM The Sports Hub. 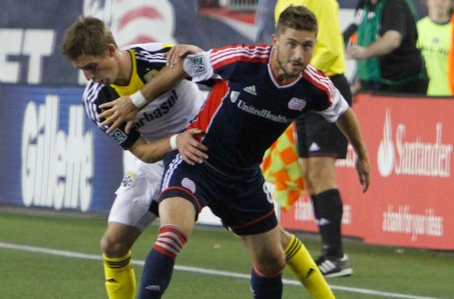 Season series: First meeting of the season; Revolution won all three matches between the teams in 2013. Revolution update: 7-10-2 overall, 23 points through 20 games (1.21 points per game), with 24 goals scored and 31 goals against….Currently on a 7-game losing streak in MLS matches…Revolution have scored three goals in their previous 7 MLS games, and have not scored twice in a game since May 24th, their last win…4-3-1 at home… The Revolution will play their next three matches and 7 of their next 9 at home…The Revolution have won four straight matches against the Columbus Crew. Crew update: 5-7-8 overall, 23 points through 20 games (1.21 points per game), with 23 goals scored and 26 goals against…The Crew won their last MLS match 2-1 over Montreal last week, recording their first win in MLS competition in seven matches…Columbus is also coming off a 2-2 draw in a mid-week friendly match with Crystal Palace, although the Crew’s regulars were given the night off….The Crew have conceded 8 goals in their previous four MLS matches…Federico Higuain is the Crew’s greatest weapon, leading the team with six goals and five assists this season…Crew defender Michael Parkhurst makes his return to Gillette Stadium for the first time as a player since his four-year stint with the Revolution from 2005-2008. The Rhode Island native won the MLS Rookie of the Year in 2005, MLS Defender of the Year in 2007, and was a member of the 2007 U.S. Open Cup Championship team before playing overseas from 2008-2013. Injuries: The Revolution have two players out – Andy Dorman is out with a right MCL sprain and Shalrie Joesph is out with a left calf strain. The Crew have a number of players out which include midfielder Hector Jimenez (right MCL sprain), midfielder Fifi Baiden (left groin/hip strain), midfielder Matt Wiet (left ACL reconstruction), defender Josh Williams (left groin strain), and forward Jairo Arrieta (left hamstring strain). Two players are also questionable for the Crew: Defender Ben Sweat (lumbar strain) and midfielder Agustin Viana (right hamstring strain). Next for Revolution: Wednesday, July 30th, at 7:30 PM at home vs. The Colorado Rapids.